If you have a cutting torch made by Airco, ESAB, Harris, Meco, Oxweld, Purox, Rego, Smith or Victor you only need to change the tip to a 2-piece natural gas tip - keep the handle and cutting attachment you already use! - Standard Pre-Heat tips have converged straight bore oxygen jets and work with 15 - 60 psi oxygen cutting pressure. Why should you purchase natural gas cutting tips from G-TEC? 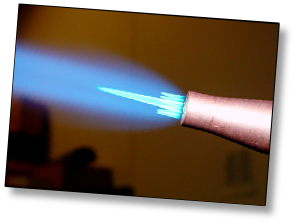 G-TEC Natural Gas Tips are competitively priced with OEM acetylene and propane tips - you won’t spend more for tips to cut with natural gas! G-TEC brazing equipment features a modular design of mixers, goosenecks and tips that are interchangeable for maximum flexibility. G-TEC Mixers provide the correct fuel/natural gas ratio for the hottest flame and are specific to each manufacturer’s torch handle. Mixers designed for acetylene will not work with natural gas while mixers for propane and propylene may give uneven performance. Get the hottest flame with a G-TEC mixer. G-TEC Goosenecks are available in sizes from 3” length to 12” length and fit on the range of Mixers. G-TEC multi-flame and single flame tips are interchangeable on these goosenecks to maximize flexibility and minimize cost compared to all-in-one mixer/gooseneck/tip combinations. G-TEC has a range of Heating Heads capable of delivering from 50,000 to 500,000 BTU per hour for pre/post weld heating, bending and more. 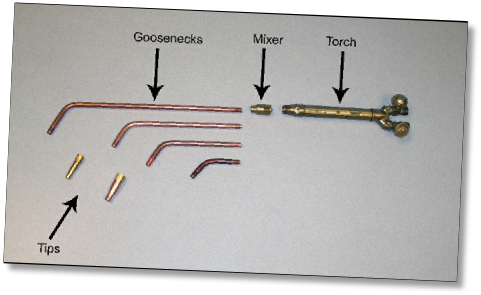 Shells are machined from solid copper bar stock and internals are machined from brass then press fit and pinned to prevent separation during a backfire. 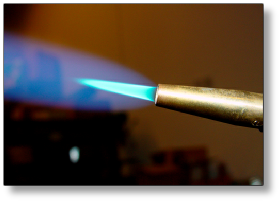 G-TEC Multi-flame Brazing Tips provide a hot, broad flame that wraps tubular fittings to provide an even heat that brings the joint to brazing temperature quickly. Wrap around heat means that when the filler metal is applied it will flow farther, fill more completely and reduce the potential for gaps or oxidation defects. 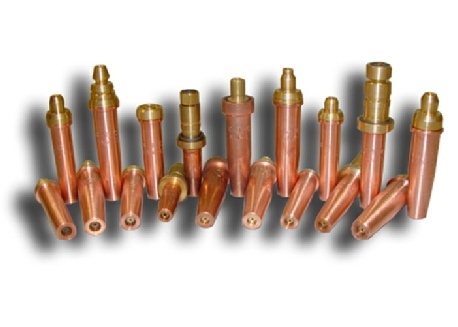 Tips are available in sizes from 0 to 10 so they are suitable for the smallest diameter tube up to 4” copper pipe. G-TEC also has Single Flame tips for those who prefer that style flame and they are available in sizes from 4-8. G-TEC Natural Gas Tips are competitively priced! G-TEC Cutting Tips range from $ 15 to $ 25 depending on manufacturer; single flame brazing tips are $ 12 and multi flame tips are $24; Heating Heads range from $ 30 to $ 85. Use your Discover, VISA, MasterCard or American Express card to purchase G-TEC Natural Gas Torch Tips.